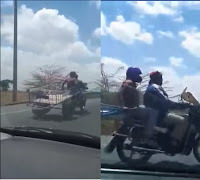 Home / Editor's Choice, Entertainment News, Featured Articles, Gossip and Drama, Videos / See how these guys risked their lives along Mombasa Road, a Mkokoteni was being towed by a boda boda (VIDEO). See how these guys risked their lives along Mombasa Road, a Mkokoteni was being towed by a boda boda (VIDEO). Friday, September 14, 2018 - The madness on Kenyan roads is too much. In this video that was taken along Mombasa Road where cars move at a speed of 110km/hr, two brainless guys are seen gambling with their precious lives. A mkokoteni was being towed by a boda-boda rider. Just imagine what would happen in-case of a slight accident.